As I got older though, things started changing. 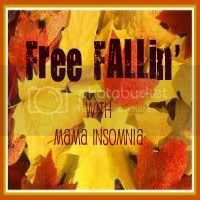 Early in my twenties, I noticed that I got horribly sick every Fall. It was the same story year after year. It would start off as the sniffles, then a runny nose and eventually a full blown sinus infection. I'm not big on doctors so I tried various medicines to try and alleviate my symptoms, but nothing seemed to remedy my itchy eyes, constant sneezing and stuffy, runny nose. It wasn't until I started dating my husband that someone suggested to me the possibility of allergies. The year of our wedding, I finally broke down and made an appointment with an allergist. I stumbled into his office and begged him to fix me. I had a September wedding coming up and didn't want to walk down the aisle a drippy, itchy mess. After a boatload of allergy tests-which are super fun by the way- they narrowed down what I was most allergic to... Ragweed. 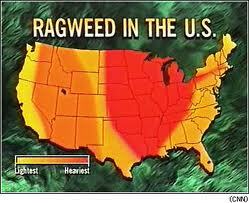 And guess where Ragweed is most predominate?? The Midwest. So every late August thru mid September, I live in misery. I have some prescription's that help a bit, but according to my allergist, my aversion to Ragweed is so severe that the only thing that will fix it is allergy shots. ﻿And that requires weekly shots and could still take up to 4 years to be effective. This year is especially tough. Being pregnant, I can't take most of my prescriptions, so for the past few days I have been in misery. My eyes look like I've been crying for weeks. And my nose...I will never understand how I can be stuffed up yet have a nose that seems to run like a faucet. What's worse is that the weather is starting to change and I want to open the windows to let the cooler air in, but that only makes my allergies that much worse. So I'm throwing a pity party for myself until late September when I can finally enjoy the crisp Fall weather. And plotting a way to destroy all the Ragweed of the world so nothing gets in the way of my favorite season. This post brought to you by my Free FALLin meme. There's still time to link up with us! !